In high school, I stepped between two girls getting ready to fight one another. One was my friend. I don’t remember the other girl. With fist raised and poised to fire, my friend would hit me if she let it fly. Instead, she looked me in the eyes and said, “Only because it’s you.” Then she walked away. 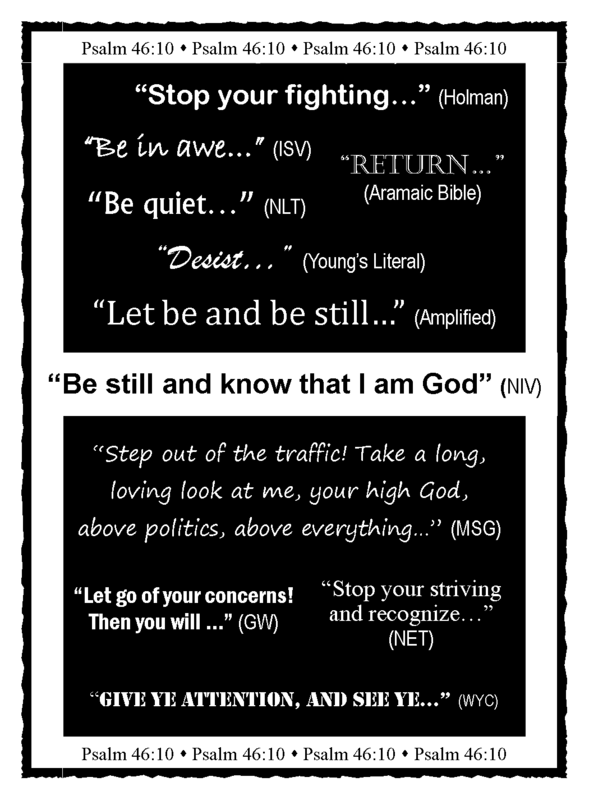 In Psalm 46:10, the “be still” phrase gets at stopping this same sort of activity. The original word — rapa — means to “slacken, let down, cease.” It’s used in the sense of someone stepping between two warriors in battle and telling them to stop fighting, to stop their frantic activity. So, the idea to “be still” goes beyond just taking a little time to relax. Beyond stopping the frantic pace, acknowledgment of the pointlessness of the activity is also important. In other words, we must stop and realize that our frantic activity will not produce any positive outcome. Frantic is one of those words that sounds ridiculous the more you say it. And when you consider all of what it means, it’s equally absurd to live in that state. Interestingly, Jesus’ parents were once frantic in their search for him. I find comfort knowing that the mother and father entrusted to raise the Son of God were also frantic parents at times. Makes my sometimes frantic parenting seem a little less unreasonable. Of course, we have plenty in our lives beyond parenting that can make us frantic… Cleaning the house like crazy to get ready for guests. Scrambling madly at the end of the quarter to meet quota. Racing from one task to the next hoping to be somewhere on time once in a while. We’ve all felt frantic at some point, and I’m guessing no one really enjoys it. What’s more, our bodies usually give us signs that we need this time off. Again, we all have moments where these happen, but we need to pay attention when patterns emerge, when we begin to dwell there. After all, we can reap some pretty amazing benefits if we allow ourselves to “be still” on a regular basis. Looking at that start of Psalm 46:10 again, but this time in several versions, helps draw out this idea of down time or time outs. Long before research proved we needed time to reflect and sort things out mentally, God told us as much. And while the mental experts say to let our minds wander, God’s word gives further instruction as to how to truly give our minds the crucial rest they need. 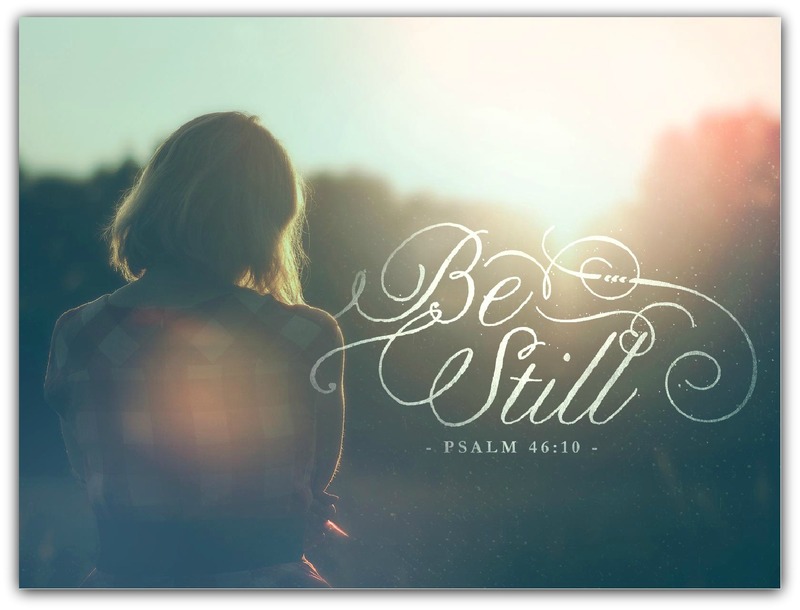 We find the answer in the second part of the “be still” phrase that begins Psalm 46:10. This hits home because, truly, what is the source of our frantic activity? Fear. Fear of not doing, being, saying, making and creating enough. 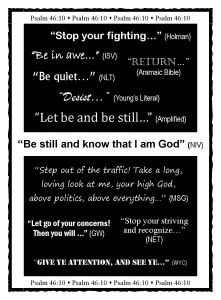 I’m not sure how this exactly plays out in your life, but I know for me having God as my constant stability gives me what I need to “be still” even as life races on around me. Sure, some days are more difficult than others, but I know that going to that still place where I know God is God keeps the frantic from consuming me. Since about 47% of Americans attend Christmas Eve church services, almost half the people living in the United States are familiar with the Christmas story (found in Matthew 1-2 and in Luke 1-2). Many likely know it by heart. I’ve heard the Christmas story from every possible perspective — the shepherds, Mary, Joseph, the wise men, the innkeeper, even the stars in the sky and the animals in the stable. Uncountable modern tellings focus on the meaning of Christmas from every point of view. One version delves into the idea of “no room” at the inn in Jerusalem. For whatever reason, the inn could not accommodate a pregnant Mary and her husband Joseph. This physical circumstance connects to the spiritual reality that even before Jesus’ birth, people failed in making room for Him amidst busyness and rush. The hurry and bustle of the holiday season distracts so many from making room for Christ. Really, busyness prevents a focus on Him year round. 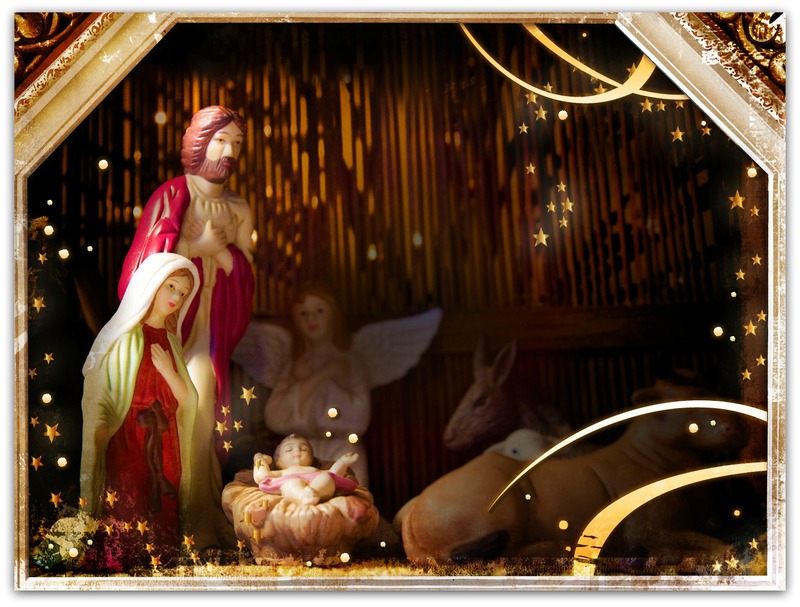 From before His birth to Christmas today, there seems to be the all-to-common state of “no room” for Jesus. The solution lies with a new perspective and deliberate effort. He won’t force His way into our lives, but He certainly provides ample opportunity for us to welcome Him of our own accord. Making room for Christ in a busy life starts with hearing the voice of the Lord through the holiday noise. It involves deliberately seeking His peace amidst the all-consuming busyness during the holidays and beyond. This approach begins with a change of focus as we ask God to speak to us and then as we add intentional effort to hear his voice. That requires stopping physically, mentally, spiritually and, especially in our modern culture, electronically. Making room for Jesus involves removing ourselves from the intense volume of the world. It means reorganizing our lives and making room by de-cluttering to get rid of distractions. God does still speak to us. He still offers peace. And He still provides wisdom. Our part in the equation requires enabling ourselves to hear Him. In doing so, we not only “know” He is God, we understand the perspective of many on that first Christmas — the shepherds, the wisemen, Mary & Joseph — who rearranged their lives to usher in the Christ child. What do you need to remove or rearrange to make room for Christ now and in the coming year? 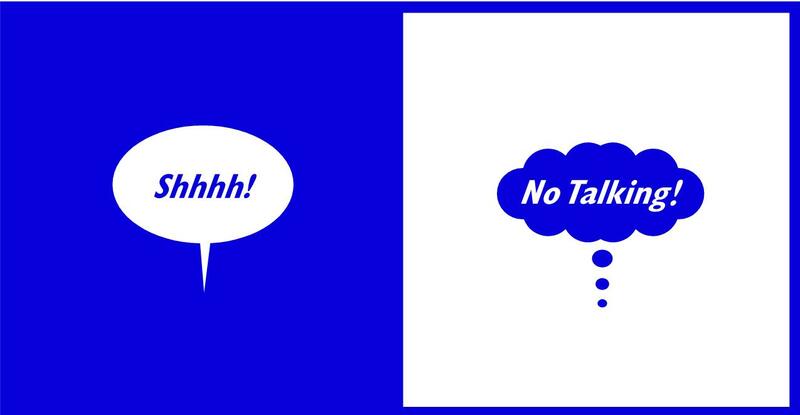 Few people can ever truly experience total “absence of sound,” the definition of silence. 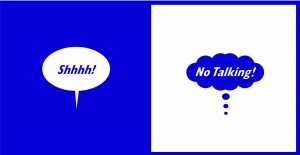 So, after several of these “silence” conversations, I realized that taking time to clarify silence a bit more might help address the “Why bother?” implication. My favorite times of silence are bike rides, running, hiking, kayaking, and mornings on my deck. These times are not absent of sound, but they are peaceful and quiet. Essentially, when someone develops a discipline of silence, he/she really learns to appreciate peace and quiet along with the benefits of regularly pending time there. Spending time in peace and quiet involves reducing or eliminating unnatural sounds so that natural sounds (breathing, birds, footsteps, wind, etc.) are mostly what’s heard. In other words, a discipline of silence means intentionally choosing not to bring noise into the equation. It means choosing to not talk, play music or watch television. It means not introducing unnecessary sounds (keeping certain things silent) and instead existing in a quiet and peaceful arena. Realizing that the goal in a discipline of silence is really peace and quiet, not literal silence, helps understand how to achieve a true discipline of silence. A discipline of silence allows you to think and to process life. Developing a discipline of silence means making a regular practice of simply existing with the natural sounds of life. It involves thoughts being allowed to move freely without little outside influence. When Rick at Planned Peasanthood and I decided to simultaneously post on the discipline of silence, my objective was to show the value of the discipline. I now realize (mostly after reading Rick’s posts) that my own discipline of silence has developed into more of an active quiet rather than a true discipline of silence. I spend much of my time in my office or kitchen or on my deck writing, researching or studying, and I do so in relative quiet. But, I realized that I am always doing something during quiet times, more like quiet activity than disciplined silence. I’m often writing, reading or talking, but rarely just sitting and allowing my thoughts and my body to just be still. In that, my own discipline of silence requires growth. Instead of continually taking in and then regurgitating information, I need to spend time processing. I need to consider how the information I encounters fits into my life and, more importantly, I need to weigh it against the Truth of God’s Word. 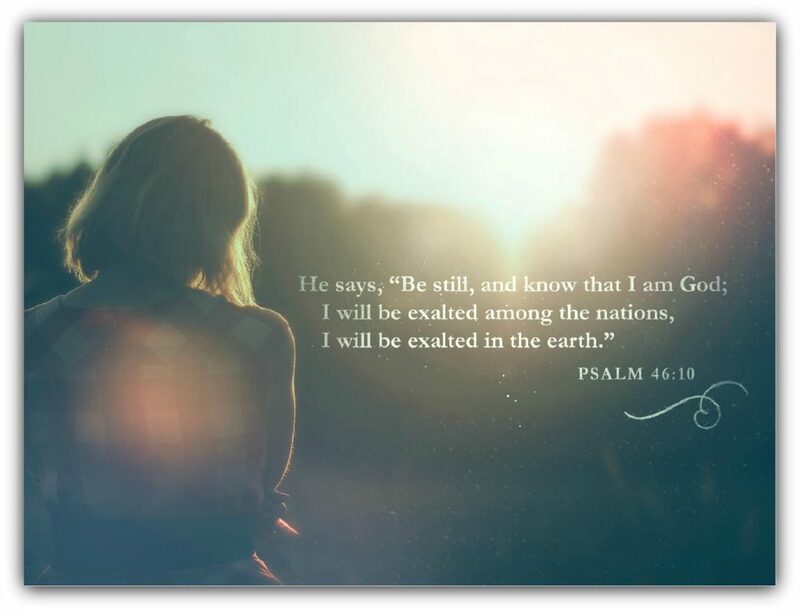 Amplifying silence means taking time to “Let be and be still…” as suggested by the Amplified Version of Psalm 46:10. Seeing this verse in a variety of versions helps, so check out the black and white graphic in this post (click on the graphic to enlarge it). The depth of this verse’s meaning truly gets at the goal of a discipline of silence: Deliberately choosing to think and to process life on a regular basis in as peaceful and as quiet of an atmosphere as possible. Just existing in stillness and letting all else simply be without you for a while. Take time to weigh your own discipline of silence (or lack thereof) against the truth in this Psalm. DISCUSSION: How does Psalm 46:10 help in encourage you to amplify the discipline of silence in your life?